My contention is that most of the NASA space program is probably a hoax. I say "probably" because I don't know. But neither does anyone else and I think that's unacceptable. A faith-based space program during this great age of the scientific method is unnecessary and absurd. It's way past time for NASA to be scientifically accountable. After my painful 2003 epiphany regarding 9-11, I gained the courage to confront my mythological beliefs about the space program and other things. I was confronted with the difficult question, "How do we PROVE we went to the moon?" Photos? Video? Could be fake. Narrative? Could be lies. Launches? Yes, but what happened after they went into orbit out of sight? Did they really go to the moon? Do they really go to the space station or is just a lighted orbiting umannned and possibly inflatable prop? Did they really repair a Hubble telescope? What about the flag waving? I don't know and there's nothing we can prove about it on Earth. What about the shadows? I don't know and there's nothing we can prove about them on Earth.What about the Lunar laser reflector? I don't know and who knows how it got there even if it's actually there. But then I stumbled upon the spacesuit ice sublimators. Being in either the vacuum of orbit or the vacuum of the moon, heat transfer is a difficult engineering challenge. There's nothing cool to conduct heat to, there's no atmosphere so there's nothing to convect heat to and a radiator would be huge and ungainly so NASA describes the clever and exotic technique of using nickel porous plate ice sublimators to explain how heat was allegedly transferred from the spacesuits and the Lunar Modules(LM). A primary closed loop of water circulates around the heat source, either a human body or the Lunar Module, through a nickel porous plate heat exchanger. The secondary side of the heat exchanger is open to the vacuum of space through many small pores. Water passes into the heat exchanger, receives the heat of the closed primary loop and then, because it's exposed to vacuum, phase changes from liquid to ice and sublimates into space transferring heat with it. Very neat and ingenious. Naturally, I wanted to learn more. What does a spacesuit sublimator look like? Specifications? Procedures? Video of one being tested? Photographs? Technical discussions in heat transfer or thermodynamics books? I searched. Strangely and absurdly, I found almost nothing. I received almost nothing. I got stonewalled when I appealed for information. Absurdly, there were no photographs. Absurdly, there was no video of spacesuits with ice sublimators being tested. Most absurdly, there was no information in any academic-level heat transfer or thermodynamics books. Absurdly, the alleged manufacturer, Hamilton Sunstrand of United Technologies would only release very elementary information. Absurdly, NASA's Johnson Space Center refused to provide video or photos and stonewalled me instead. Absurdly, the Rice University Department of Mechanical Engineering, most closely associated with Houston's Johnson Space Center refused to comment. Absurdly, my Congressional representatives in two states, California's and Washington's Feinstein, Boxer, Cantwell, Murray, Capps and Hastings, stonewalled me also when I requested their assistance acquiring accountability from NASA. But voila! The good news was that I had stumbled upon the way to PROVE whether the NASA space program was a hoax. The lack of information and evasion regarding spacesuits with sublimators represents a huge anomaly upon which attention should be focused. NASA must publicly demonstrate, before independent witnesses, a spacesuit with ice sublimator cooling system in a high vacuum chamber on Earth duplicating environmental conditions of orbit. NASA refuses to be accountable. It's unacceptable. We can PROVE today on Earth if the NASA space program is a hoax. For independent witnesses I recommend retired Army General Antonio Taguba, retired Navy Admiral William Fallon and me. Please demand NASA accountability from your respective Congressional representatives.As President Ronald Reagan said in his Farewell Address, "We the PEOPLE tell the government what to do; it doesn't tell us." Please tell them that you want to see a spacesuit with ice sublimator work in a high vacuum chamber on Earth. Re: Why I suspect Apollo was a hoax. But neither does anyone else and I think that's unacceptable. A faith-based space program during this great age of the scientific method is unnecessary and absurd. It's way past time for NASA to be scientifically accountable. There is nothing 'faith-based' about understanding how Apollo was accomplished. I strongly suggest you disabuse yourself of the notion that anyone here believes Apollo is a matter of faith. The usual 'I used to believe' stuff I see. Photos? Video? Could be fake. See above. You can't just brush off huge swathes of material and anecdotal evidence because it 'could be' fake or lies. Launches? Yes, but what happened after they went into orbit out of sight? Did they really go to the moon? Do they really go to the space station or is just a lighted orbiting umannned and possibly inflatable prop? Did they really repair a Hubble telescope? Any evidence for any of those propositions? What about the flag waving? I don't know and there's nothing we can prove about it on Earth. What about the shadows? I don't know and there's nothing we can prove about them on Earth. Not only false but repeatedly shown to be so. What about the Lunar laser reflector? I don't know and who knows how it got there even if it's actually there. Quite a few people know, and quite a few people would have to know, however it got there. Because you don't know doesn't make that a valid argument. Naturally, I wanted to learn more. What does a spacesuit sublimator look like? Specifications? Procedures? Video of one being tested? Photographs? Technical discussions in heat transfer or thermodynamics books? I searched. Strangely and absurdly, I found almost nothing. I received almost nothing. How much effort did you put into your search? Absurdly, there were no photographs. Absurdly, there was no video of spacesuits with ice sublimators being tested. False. There is film of spacesuit tests, and since the ice sublimator was a major part of the spacesuit then it was by definition being tested in those tests too. Your complaint is analagous to complaining there is no video of a test of an air conditioning system used on a commercial jet airliner. If it flies and people can live in it at altitude then the air systems work even if no specific pointer is made to the fact. But just out of interest, exactly what do you expect to see in a video of an ice sublimator cooling system being tested? Absurdly, my Congressional representatives in two states, California's and Washington's Feinstein, Boxer, Cantwell, Murray, Capps and Hastings, stonewalled me also when I requested their assistance acquiring accountability from NASA. Maybe because they recognise the absurdity of asking for accountability from an organisation as publicly open as NASA already is. But voila! The good news was that I had stumbled upon the way to PROVE whether the NASA space program was a hoax. No, the Apollo program is not a house of cards ready to tumble at one single anomaly. NASA must publicly demonstrate, before independent witnesses, a spacesuit with ice sublimator cooling system in a high vacuum chamber on Earth duplicating environmental conditions of orbit. Film and video of spacesuit tests in vacuum chambers is readily available, and since the cooling system must be functioning in order to prevent the astronaut from overheating inside a sealed rubber suit, your conditions have been met. Please tell them that you want to see a spacesuit with ice sublimator work in a high vacuum chamber on Earth. And you would be flat out wrong. On all counts. CTists almost always find that once they swallow one load of hogwash, the next load of hogwash is easier to swallow no matter it's size. Thousands of photos and countless hours of video all faked in the largest vacuum chamber ever created which conveniently disappeared without trace. Sorry. Your claim, your burden of proof. How could they be faked? Not much point in that since they actually went. Launches? Yes, but what happened after they went into orbit out of sight? Did they really go to the moon? They were independantly tracked all the way there and all the way back. Do they really go to the space station or is just a lighted orbiting umannned and possibly inflatable prop? So now the US is in cahoots with the Russians, all of Europe, the Indians, the chinese in fact pretty much everyone to haox the ISS. Are you the only one who is not "in on it"? Did they really repair a Hubble telescope? It was broken. Now it is fixed. Seems pretty clear that they did fix it, no? What about the flag waving? What about it? It "waves" when the astronauts interact with it and at no other time. I don't know and there's nothing we can prove about it on Earth. Wrong. There is nothing unusual about the shadows. All of their effects can be demonstrated on Earth in sunlight. Of course it's there. Anyone can point a laser at it and measure the response and they do. It is used to measure the precise rate of recession of the Moon. They were placed there by the Apollo astronauts. All of those sources are publicly available on the internet. Your inability to find them is your problem and nobody elses. Do you think they waste their time answering every moon hoax crank question, or do you suppose that they simply file such requests under T for Trash? That would be part of the test schedule for EVERY space suit, so it has been done countless times already. Why would one more repetition be somehow "special"? Why should a "special" test be set up just for you? Are you going to foot the bill? https://www.youtube.com/watch?v=7yNoOYjR0_g Orlan suit vacuum test. I'm sure your sooper resurch skillz can find more. I say "probably" because I don't know. But neither does anyone else and I think that's unacceptable. So your claim is that no one can possibly know whether a national space program is authentic? What does a spacesuit sublimator look like? Specifications? Procedures? Video of one being tested? Photographs? Technical discussions in heat transfer or thermodynamics books? I searched. Strangely and absurdly, I found almost nothing. I received almost nothing. 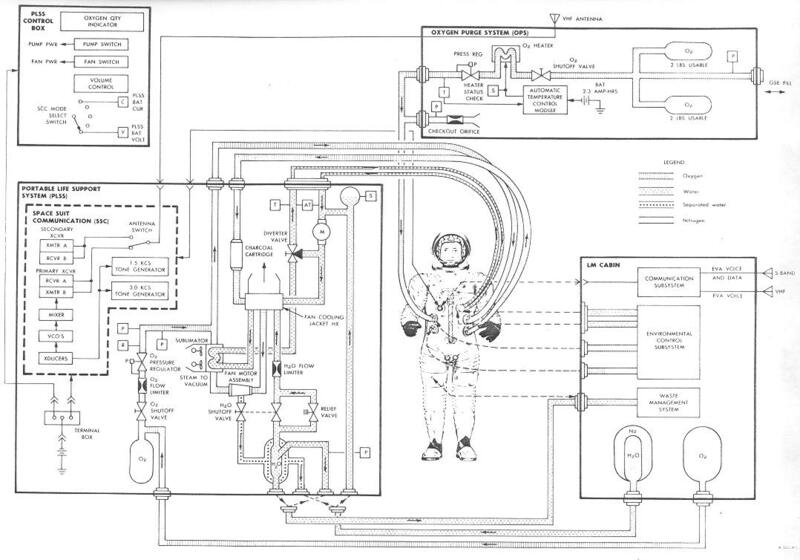 It took me about 8 seconds to find a photo of an Apollo space suit sublimator via a Google search. I got stonewalled when I appealed for information. Gee, I can find all sorts of information. Of course I'm an aerospace engineer with about 25 years' experience in the field, so maybe I have a leg up. But most people here are not professionally qualified, yet they will astonish you with their ability to research and understand the relevant topics correctly. Since every spacefaring country uses the porous plate sublimator, and it's one of the most common and well-understood bits of space engineering, and it's been in every space suit design since the 1960s, I have to conclude you have poor research skills. Of course your blanket insistence that world spacefaring is entirely a fiction neatly seems to exempt you from having to deal with almost all the evidence, leaving you only with your trumped-up argument from silence. The lack of information and evasion regarding spacesuits with sublimators represents a huge anomaly upon which attention should be focused. So you're a one-issue conspiracy theorist. Gotcha. Or how about in every space walk ever, since Apollo? Please demand NASA accountability from your respective Congressional representatives. I would rather demand accountability from you instead, since you're the one ignorantly calling an entire profession liars for quite a number of years. You claim to have performed a diligent search, and you list a few steps of that search. Do you really want to claim that was exhaustive enough to assert before the world that the nickel porous plate sublimator is a fiction? Think carefully before you answer, and remember that your posting history elsewhere is easily searchable. Take your proudest accomplishment, Neil. Whatever you did that you're happiest about. Now, imagine that someone went around saying it could be faked just because they weren't there and don't understand what you did. What would your reaction be? Especially when every response to what you told them as evidence was, "Oh, that could have been faked" without ever suggesting a plausible answer about how it was faked. I see you've been banging this same drum since at least 2011, and you've already been provided with the evidence of suit testing many times over. You simply refuse to accept it. Same old argument from ignorance. Let's see your detailed analysis of this document. With calculations please. What does a spacesuit sublimator look like? 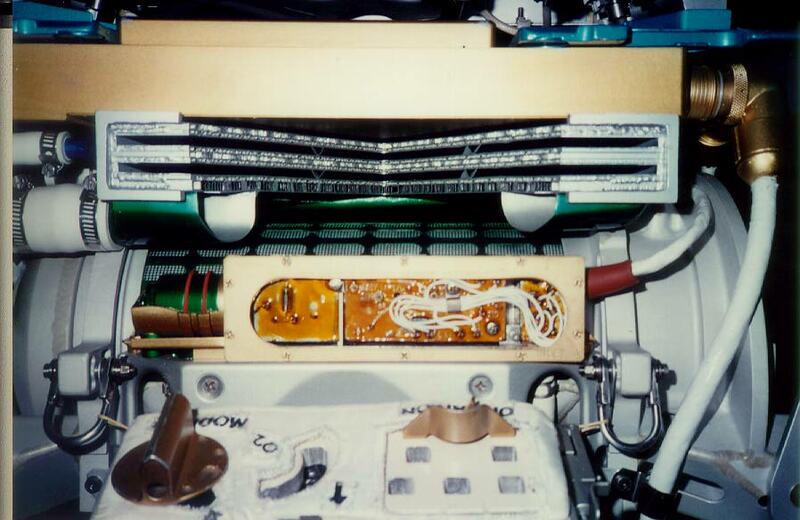 A close up view of the heat-exchanger/sublimator (silver cutaway structure), radio module (gold), and the lithium hydroxide (background, in green/white). The Remote Control Unit (RCU), in the foreground, is mounted on the crewmember's chest. The sublimator and heat exchanger are part of the "return circuit" of the PLSS. Oxygen, warmed by the heat generated by the astronaut's body, is cooled in the heat exchanger before being passed through the lithium hydroxide canister to eliminate exhaled carbon dioxide. Water circulated through the Liquid Cooling Garment (LCG) also flows through the heat exchanger where it gives up heat to a separate supply of cooling feedwater. The feedwater flows into the sublimator, where it is added to a layer of ice and, ultimately evaporates and carries away excess heat. In the foreground, the controls of the chest-mounted RCU are visible. The gold rotary switch selects the radio transmission mode. To the our right of the switch is the oxygen pressure gauge. Five windows on the right display caution and warning flags that alert the astronaut to problems with the PLSS. The guarded switch controls operation of the PLSS fan which moves oxygen out of the PLSS and into the suit. Do you realize, Neil Baker, that every current generation EVA spacesuit, from the NASA EMU to the Russian Orlan, to the Chinese Fetian, uses ice sublimation as it way of removing waste heat? Moreover, the Apollo A7L wasn't just used for Apollo, oh no, it was also used in modified form for Skylab EVA. Are you claiming Skylab is fake now? Given that it fell out of the sky and derbited messily over Australia and more, that strikes me as somewhat untenable. The lack of information and evasion regarding spacesuits with sublimators represents a huge anomaly upon which attention should be focused. NASA must publicly demonstrate, before independent witnesses, a spacesuit with ice sublimator cooling system in a high vacuum chamber on Earth duplicating environmental conditions of orbit. Oh my. Anyone can see the International Space Station with the naked eye. It required a lot of the spacewalks you don't believe in to construct. Amateur astronomers these days can get detailed pictures of the station and have recorded the way it has been added to over the years. They have even observed astronauts working outside the station, so the demonstration you demand has already taken place. Strange, isn't it? A bloke pops up and claims that his searches for information have been "stonewalled". That there were "no photographs". All this despite, allegedly, many attempts to find such information. Yet, within minutes you, I and others can find such information. Yet, within minutes you, I and others can find such information. As well as examples from years ago where Baker has paraded this same argument from silence in other venues and been met by others with similar, nearly instantaneous pointers to easily available information. It's hard to maintain for years the claim that no relevant information is available when other people seem to find it so easily. Hence rather than look at the massive and nearly undeniable consilience of evidence for Apollo's authenticity culled from dozens of avenues of evidence, Baker drills down to literally one single component in the entire $23 billion decade-long engineering project and declares that unless certain specific forms of documentation are provided for certain specific modes of testing it, he is justified in declaring the whole project a fraud. It's hard to maintain for years the claim that no relevant information is available when other people seem to find it so easily. Standard hoax believer argument. "I'll ignore that huge mountain of evidence over there, to focus on this tiny area that I can't/won't understand here"
I've gone through the responses so far and I'm simultaneously impressed and disappointed. I concede I'd appreciate instruction on how Bob B located the rice.edu source on sublimators. The photograph of the ice sublimator that is presented is able to be presented because of me. I'm confident, it was my steady agitation that caused it to finally appear on the Internet. As I said in my original posting, when I first searched for information, there was no photograph. I chatted once with Harold McCann, one of the coauthors of "U.S. Spacesuits" and he sent a couple more. But the fact remains, it was not there when I first became aware of ice sublimators. And although there is plenty of video of spacesuits in swimming pools there's none of spacesuits with sublimators in vacuum chambers. There is, however, a video on YouTube from 1966 of a spacesuit without sublimator failing in a vacuum chamber resulting in a near fatality. But the question remains, "Can we PROVE we went to the moon?" And the answer is "Yes, publicly demonstrate before independent witnesses a spacesuit with ice sublimator cooling system in a high vacuum chamber on Earth duplicating environmental conditions of orbit." If NASA truly used spacesuits on the moon and in orbit as it alleges then it also regularly tests those suits on Earth in high vacuum chambers as it also alleges it does. It should cost nothing extra and impose little inconvenience to allow independent witnesses to observe. But they refuse which is an anomaly that must be addressed. I understand the passion and pride involved in this subject. It's not pleasant to contemplate the possibility of losing your moon. Law enforcement officials report that they suspect the crime of fraud is most often unreported for the fear people have of appearing to be victims. The temptation is to take the easy route and dismiss and discredit the assertion. To disparage. I've heard it all. We enjoy great fortune to live in the Age of the Scientific Method. An anomaly has been presented to you. Disparaging responses will not suffice. The challenge of a scientific response is being given. If you're satisfied to continue accepting your faith-based space program, then you either do nothing or continue jabbering with lame links and empty opinions. The only solution is to PROVE the spacesuits with an appropriate demonstration before independent witnesses. We don't have to believe; we can KNOW. After hundreds of billions of dollars, we deserve to KNOW.